We have such great volunteer Covekeepers who keep us informed of water quality issues along the Catawba. The monthly Covekeeper meetings are designed to discuss specific issues, share updates, and learn from guest speakers. But sometimes we just want to get out in nature! For our previous meeting we hiked through the Mountain Island Educational State Forest led by Ranger Laura Shidel. 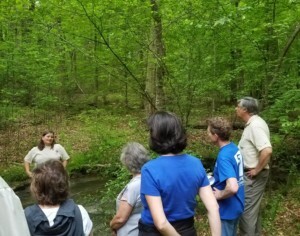 Ranger Shidel gave a fantastic talk about interdependent ecosystems that make up a forest and explained forestry best management practices related to water quality. It was a beautiful hike with a spectacular display of nature all around us! If you are interested in learning more on how to get involved with your local Covekeepers volunteer group, contact Hillary Zorman, our Volunteer and Outreach Coordinator at hillary@catawbariverkeeper.org, or visit our Covekeeper Meeting Schedule Page.